I have a mental list that comprises the hierarchy of hamburger restaurants. They are grouped as follows in ascending order. No-taste Burger factories -- Burger King, Wendy's, McDonald's, etc. There is nothing worth remembering about any of these burgers except the ones that cause stomach pain. High-Class Burgers -- Like strippers, you get what you pay for. Places like Smashburger, 5 guys, and Tony's burger put out a superior product and also charge a premium price. This type of restaurant has filled a void in my life and created a bulge in my waistline. Smashburger and 5 guys are continually fighting for my allegiance. 5 Guys has the best customizable burger. It is always well put together, and the meat is high quality. Their fries are much better as well. Like my wife, Smashburger has delicious buns. Their meat is sometimes greasy, and the toppings fairly bland. The fries are very forgettable. Based on recent experiences, I have strayed from Smashburger. When I spend 11 bucks on lunch, I expect a fantastic experience and maybe a happy ending or a mint. Smashburger was letting me down on all fronts. I had cut my visits drastically. As I am a member of the Smash club, they send me their promotional offerings via e-mail roughly 7x a day. I generally ignore them, but a recent new burger caught my eye. The Fresh Mex Burger. 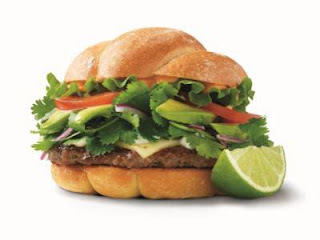 This scrumptious-looking sandwich has 100 percent Certified Angus Beef --topped with fresh avocado, chopped cilantro, onions, pepper jack cheese, lettuce, tomato, sour cream and spicy chipotle mayo on a Mexican roll, served with a wedge of lime. Ole!! If you check out Smashburger’s Facebook Page you can sign up to receive a coupon for a FREE entree with the purchase of the new Fresh Mex Burger or Chicken Sandwich. 5 mucho gusto stars for this delicious burger experience.